Summer is in full swing around here, and I'm excited to share more summer-themed sewing I've been doing! At Quilt Market last month, I got to meet Elizabeth and Liz of Simple Simon & Co., and they were just as genuine and kind in person as I'd imagined! 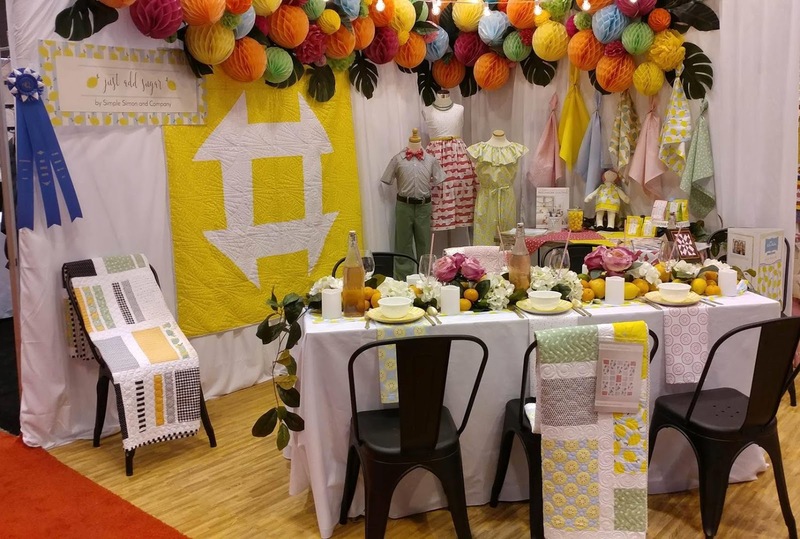 They won the best booth award for their new fabric line "Just Add Sugar" with Riley Blake Designs. "Just Add Sugar" is a lemon-themed fabric with a great back story. 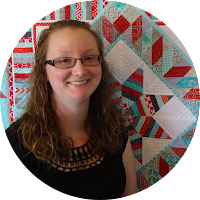 When I introduced myself, Elizabeth actually had seen my Sliced watermelon quilt! 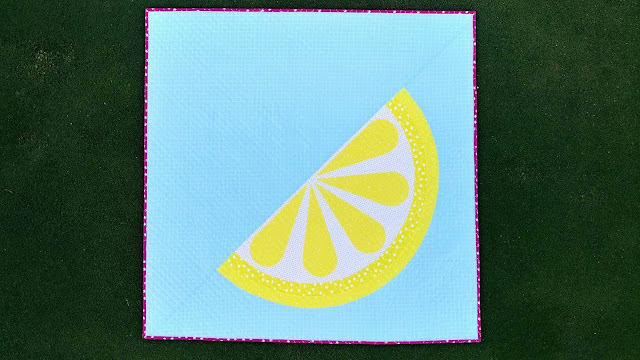 She asked if I could make a lemon quilt with their fabric. Fast forward and month, and here it is! 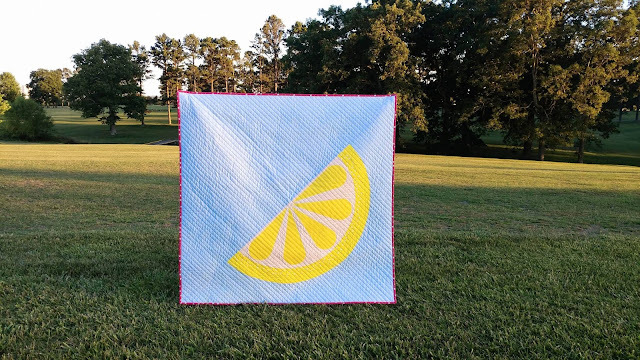 The whole time I was working on this quilt, I kept craving a frozen strawberry lemonade! The colors are so bright and summery! All piecing and quilting was done with Aurifil 50wt thread in white #2024. The batting is an 80/20 cotton/poly by The Warm Co. I used my walking foot to quilt straight lines on the diagonal. It created a great texture! 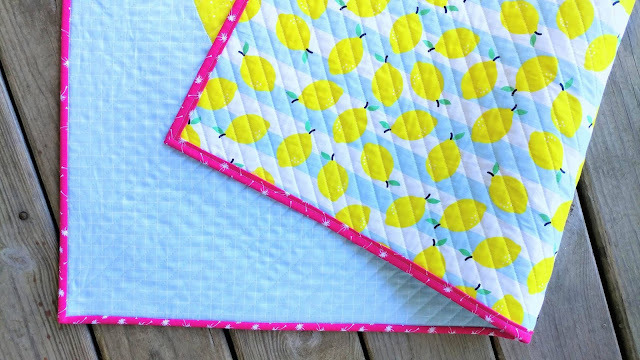 I really love how fun this quilt is, and the hot pink binding is like the straw in the lemonade glass! It's the perfect final touch! The print on the back is my favorite in the whole collection! Once finished, we headed out to the local golf course for a photo shoot. This was my first time on a golf course in my whole life! Did you know the grass near the holes is only 1/8" tall?? I didn't even know that was possible! The pattern for this quilt is available digitally on Etsy and Craftsy! 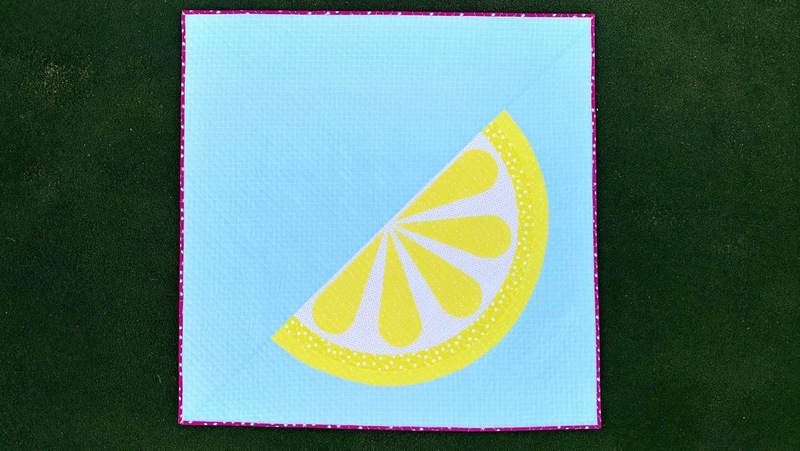 Be sure to check out the other projects made with "Just Add Sugar" on the Simple Simon & Co. blog! 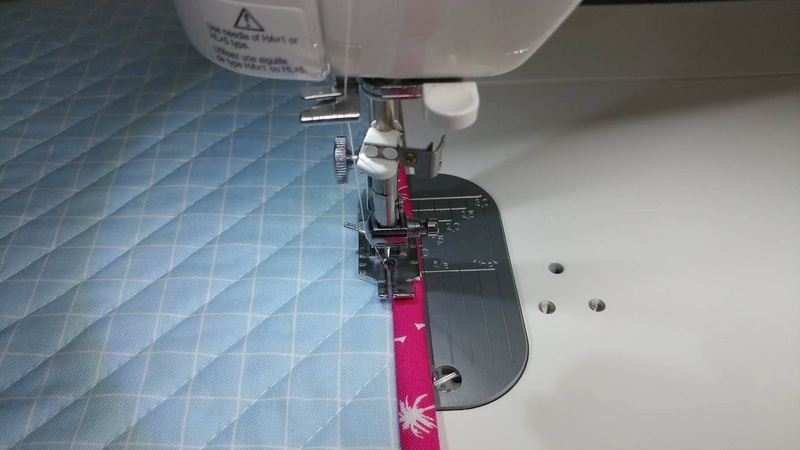 I'm also linking this post up with the June Buggy challenge at Persimon Dreams, Main Crush Monday at Cooking Up Quilts, Let's Bee Social at Sew Fresh Quilts, Needle and Thread Thursday at My Quilt Infatuation, Can I Get a Whoop Whoop? at Confessions of a Fabric Addict, Finished or Not Friday at Busy Hands Quilts, and Finish It Up Friday at Crazy Mom Quilts. How about you? Have the longer summer days helped you finish any projects lately? I have a few more summer-themed projects planned for the next few weeks! 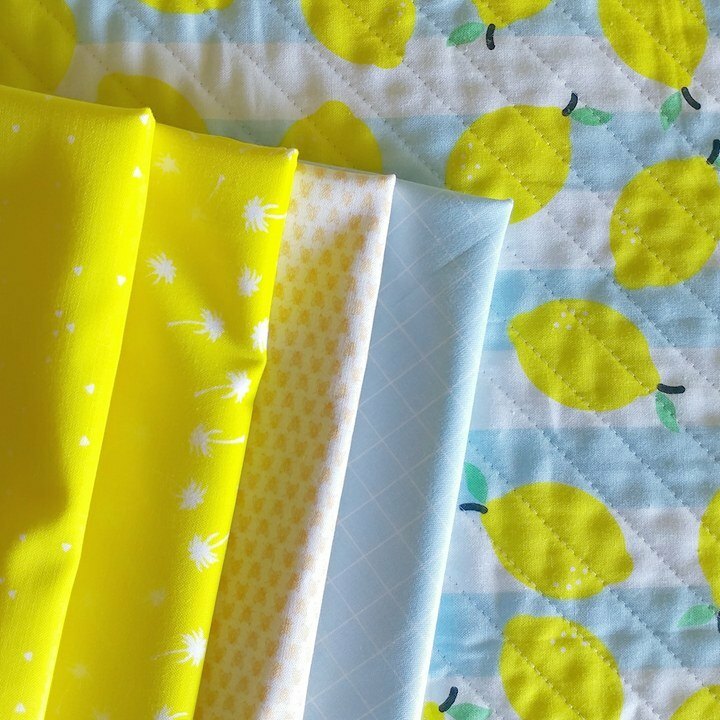 I love the lemon quilt -- the colors are amazing! Nice work! What an awesome collaboration! 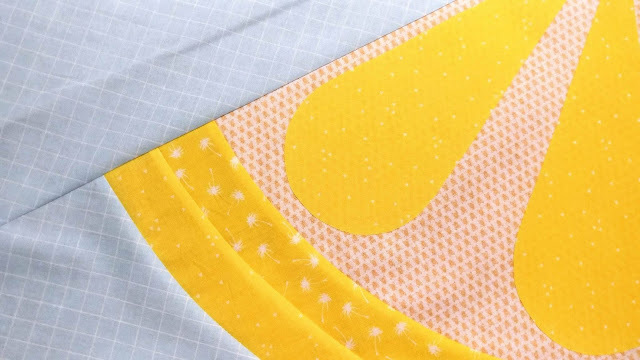 Those prints are so sweet and the quilt is perfection. Just so refreshing! Beautiful Job! 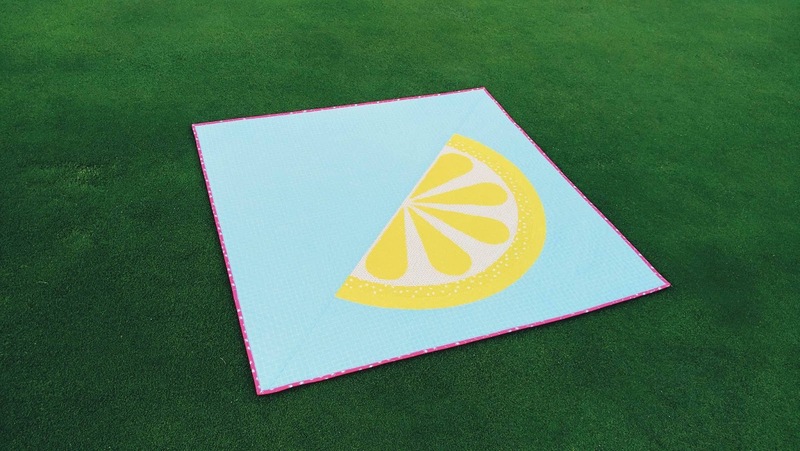 How can I get a copy of the lemon pattern? Thanks so much. 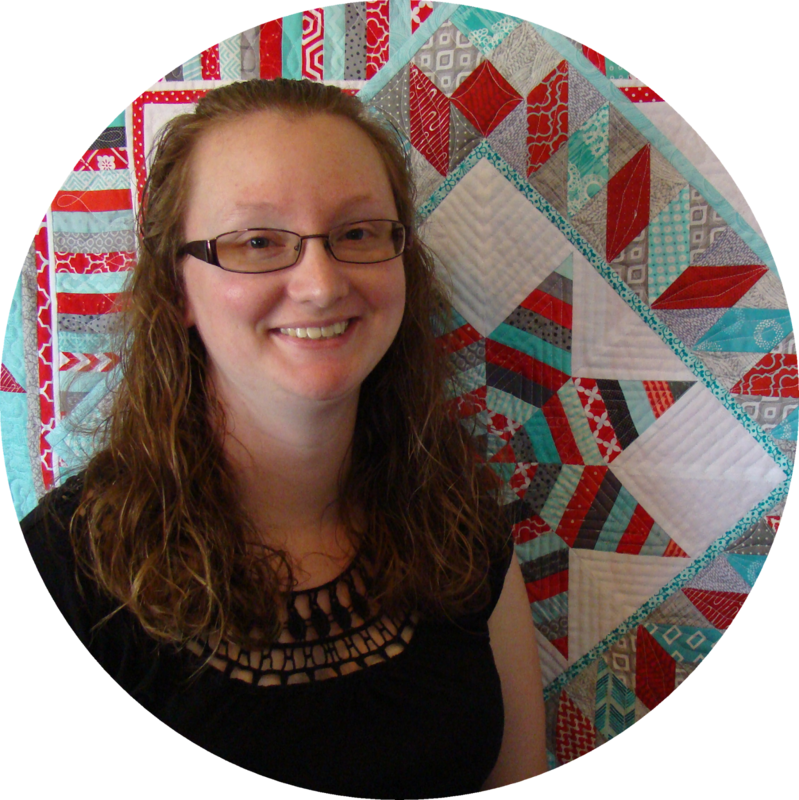 The prints are beautiful and your quilt is just gorgeous!! Such a summery fun and refreshing quilt! Laura, this is another great little quilt! What fun to be asked by them to do this quilt. Great job! 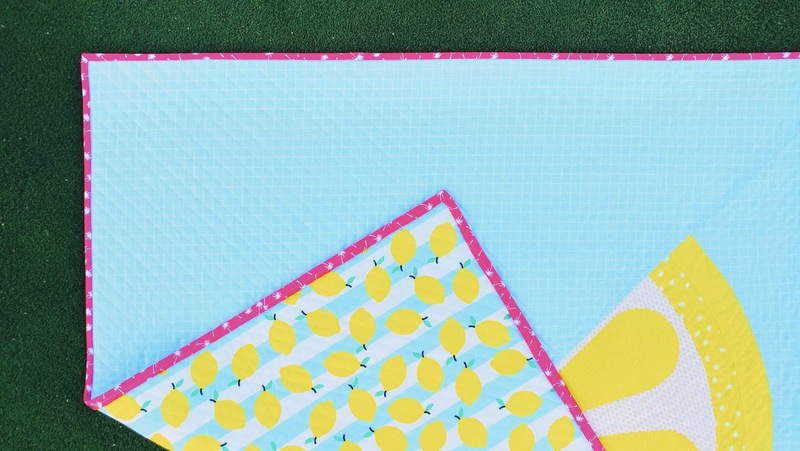 What a fun summery quilt!! Thank you for hosting this week! This one is lovely design that I must appreciate. It is attractive and provide best glance at first look. Thanks for sharing it. Love this! 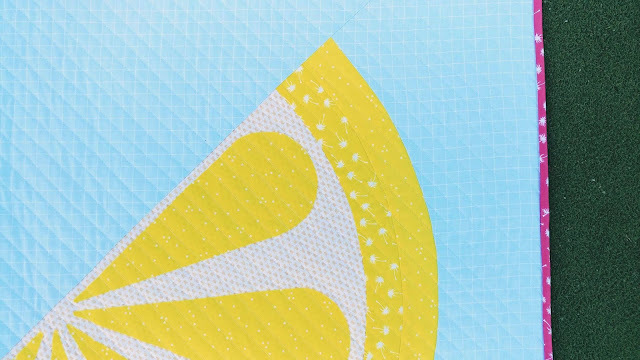 The bright yellow is a show stopper, especially as a big lemon! The binding representing the straw is just plain genius! Sweet quilt! Thanks for hosting. The perfect summer finish! Thanks for hosting TGIFF. This is a fantastic quilt. You may have found your niche! Definitely you're great at it. Thanks for hosting TGIFF, too. What a fun summer quilt! It's understandable about your craving as you worked on it! Thank you for sharing! 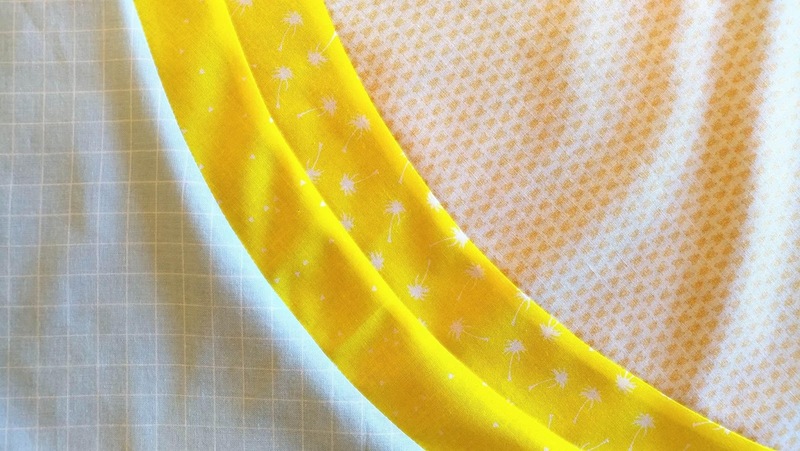 How can I get a copy of this pattern?